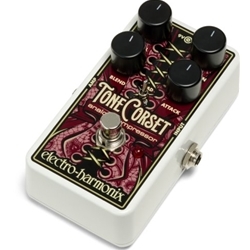 The Electro-Harmonix Tone Corset compressor effects pedal offers dynamic control of your tone while retaining the nuance and personality of your playing. Dialing in the squish couldn't be easier thanks to controls for Sustain and Attack. And if you want more of your original signal to cut through, simply bring it in with the blend knob. And the Tone Corset's pad switch enables you to get the most from your guitar whether it's a vintage Strat or an active-humbucker-loaded metal machine. Grab a Tone Corset from Sweetwater, and get control of your tone.